Drivers navigate highway construction work zones every day. It seems that the heavily traveled roads in this region are constantly being widened, repaired or repaved. According to data released by the Federal Highway Administration, dangerous road construction zones cause tens of thousands of crashes, injuries and fatalities every year. During 2010, 1.6 percent of all car accidents in the US happened in highway work zones. During any given hour, four people are injured in an accidents in a road construction zone. 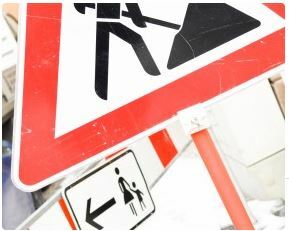 Most road construction collisions break down into three types of accidents: rear-end collisions, sideswipes, and collisions with stationary objects such as barriers or signs. The study found that there is no significant difference in injury statistics between daytime and nighttime accidents. There were 514 fatal motor vehicle accidents in highway work zones during 2010, a reduction from the 2008 total of 720 fatalities. Most fatal crashes occurred during the daytime on Wednesdays, Fridays and Saturdays in work zones with speed limits of 55 mph or more. Factors that contributed to fatality injuries included speeding, alcohol use and nonuse of seat belts. For highway workers, injuries were caused by falls, contact with vehicles and exposure to toxic substances. TorkLaw specializes in representing car accident victims who have been injured because of hazardous road conditions. If you’ve been injured in a work zone car crash, contact the TorkLaw team for a free consultation.